I Checked the BOM report this morning YASI and BOM are refering to 95p. I think 94p is out of BOM jurisdiction? The tropical low has moved into the Gulf of Carpentaria west of Weipa and is intensifying. Kowanyama to Saibai Island, extending to adjacent inland areas. Location: within 85 kilometres of 12.9 degrees South 140.9 degrees East, estimated to be 110 kilometres west southwest of Weipa and 100 kilometres west northwest of Aurukun. Movement: west at 20 kilometres per hour. there is a high chance it will develop into a tropical cyclone early on Tuesday. The system is then expected to turn back towards the Cape York Peninsula coast on Tuesday. ACCESS r showing poor symmetry today for 95p. The core showing E_ W elongation. A central location is seen just west of Weipa radar(512km) in the GOC. ACCESS suggesting an eastward track from tomorrow and into the week , with good symmetry. Please continue discussion regarding 95p in the relevant thread. In the season, what is coming next? Saw something on facebook around the 28 Jan...to those in the know...anything to it? Can't remember who put it up...sorry! gfs toying with a low/tc hanging about the gulf/cape/western coral sea very late in the extended run. monsoonal burst. Now CMC and EC go out to the 24th they too have something in the GoC/cape at the end of their run. Looking like we could have an exciting end to the month. Hahaha DU. We best start building an ark then. An Ark lol. I'm in Central Qld west of Rockhampton and have had to put down 2 new bores with solar pumps recently to try get some water into my tanks and dams as its drier here than i've ever seen it. Sure we got a little rain and the grass has grown a bit, but the dams are still just sun baked clay and the creeks are scattered puddles at best. Another lack of wet seasn for us it seems. for the period until midnight EST Wednesday 23 January 2019. At 2pm AEST, a tropical low was analysed along a trough, about 370km northeast of Lockhart River. The trough is expected to deepen into the monsoon trough from Monday, further developing the tropical low. At this stage, the tropical low is forecast to push southwest towards the eastern Gulf of Carpentaria. However, due to the potential of the system tracking southeast across the northwestern Coral Sea, the likelihood of a tropical cyclone in the Eastern Region will increase to low from Wednesday. for the period until midnight EST Thursday 24 January 2019. At 2pm AEST Monday, a weak tropical low was analysed along the developing monsoon trough, about 190km east of Thursday Island. The system is expected to slowly intensify and track either towards the southwest or southeast over the next few days. Conditions are expected to become more favourable from Thursday and as a result, the potential for tropical cyclone development in either the Gulf of Carpentaria or northwestern Coral Sea will increase . Another weak tropical low was analysed in the Coral Sea, near 11.8S 158.4E. Atmospheric conditions are not favourable for significant development over the next three days. ACCESSG has a very small Low / TS developing just east of the tip of the cape (146e 11s) on Friday the 25th jan .
On Saturday 26th, the low could be a small INVEST. On sunday 26th jan ( t+150hrs) tracking E/SE with some intensification and increase in size. Weipa radar showing some good circulation and formation .Interesting to see where this one goes. and the southern flank at 20-18s latitude looks to give lots of rain. Southern flank of TC would be on the Townsville vicinity on Monday with strong easterly onshore . Whether this GOC/peninsula low gets TC status or not , the current forecast has a massive surface windstream input. Here is a snap of the TS/TC centred just on the coast at 17s on Tuesday the 5th Feb with the southern flank copping the brunt . Townsville and maybe south of. Looks a bit of a beats on this snap . for the period until midnight EST Saturday 2 February 2019. The monsoon trough currently extends across north Queensland and into the northwestern Coral Sea, with an embedded tropical low over the Gulf Country. the low is not expected to move eastwards into the Coral Sea to become a candidate for tropical cyclone development. 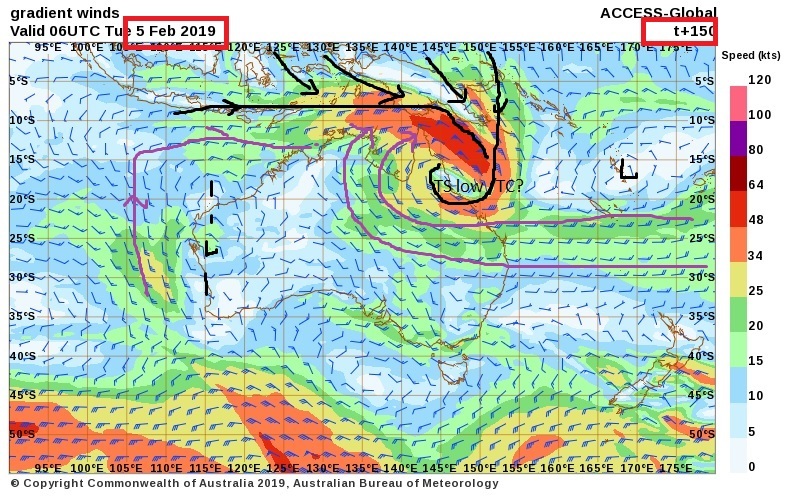 The monsoon trough is expected to remain very active over the coming days with further strengthening of the monsoon flow over the northern Coral Sea expected late in the week and weekend. There are no significant tropical lows in the region at present, however the development of a low over the northern Coral Sea will become more likely over the weekend as the monsoon flow increases. Regardless of tropical cyclone development, severe weather and moderate to major flooding will remain a risk across northern Queensland. 5 registered (Knot, ScubaSteve, slipperyfish, 2 invisible), 69 Guests and 3 Spiders online.